Dear readers, I am certain you are all acquainted with my terrible eBay habit. Lots of the old timetables, photos, and postcards find their way onto this site at some point in time. I must admit though, I love old things. Specifically, old paper things. Maybe it is because I am a graphic designer, and I love looking at old printed art, especially on pre-1900’s timetables and books. 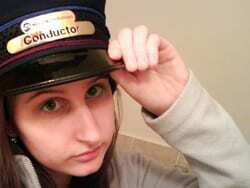 Though it is also possible that I’m just a nutjob destined to be one day featured on the show Hoarders. Either way, today I do want to share with you all my most recent acquisition, which is a little bit different than most things I come across on eBay. If you’ve ever taken the Harlem Line north of White Plains, and past Valhalla, you are most likely familiar with the large cemetery that dominates the view in between stations. Kensico Cemetery shares a nearly mile-long border with the railroad, and astute observers can glimpse the main cemetery office, which once served as a railroad station, on the west side of the tracks. The choice of location of the cemetery isn’t hard to figure out – it offered both a beautifully rural final resting place, and was easily accessible from the city by the railroad. In fact, on the cemetery’s Board of Directors was Chauncey Mitchell Depew, whose name might be familiar, as I posted about him in April. 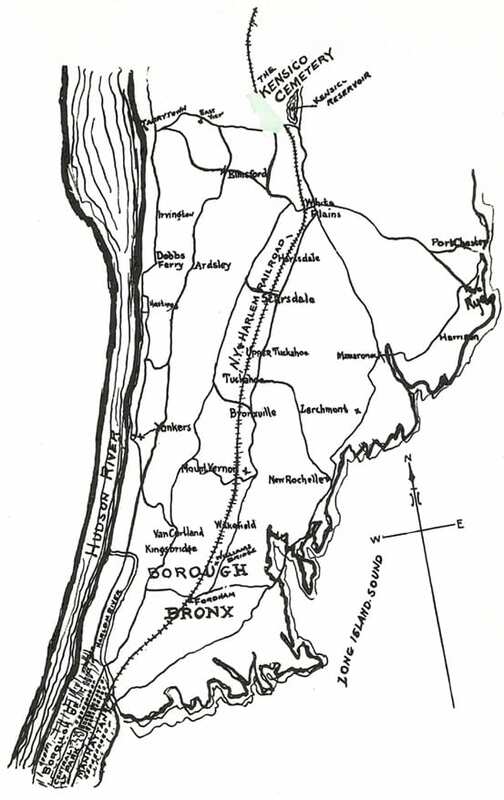 He got his start as the legal counsel for the New York and Harlem Railroad under Commodore Cornelius Vanderbilt, and eventually worked his way up to the presidency of the New York Central – conveniently the railroad running right alongside the cemetery. 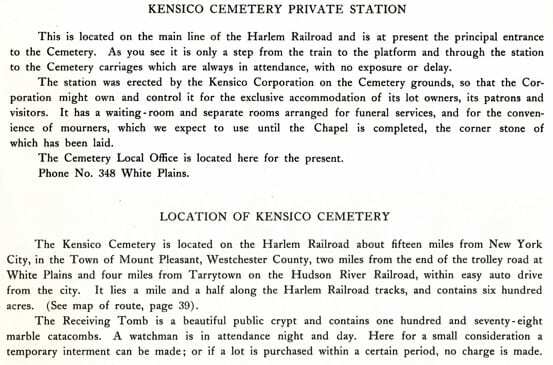 Not only did the cemetery have its own private railroad station, it also had a private railcar named Kensico which could be rented for funerals. 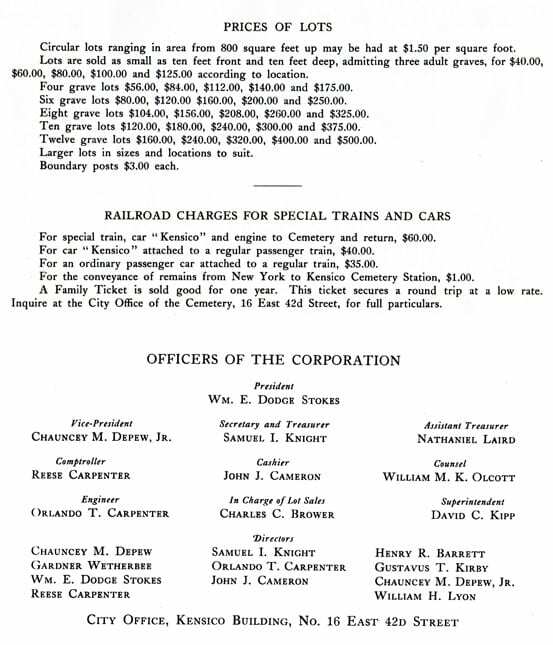 In 1910, the rental price for a locomotive with the railcar Kensico attached was $60.00, which today seems like a paltry sum. 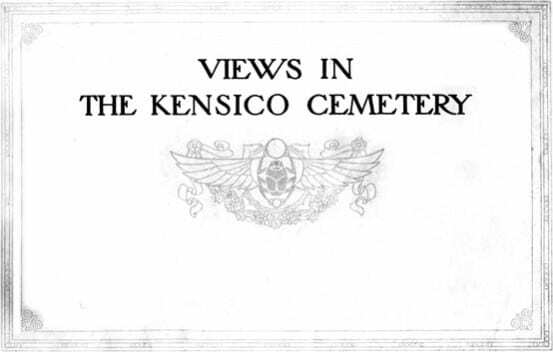 All of these things I’ve discovered about the Kensico Cemetery were gleaned from a little hand-bound booklet printed in 1910, titled “Views in the Kensico Cemetery.” I bought the thing just for the single photo of Kensico station, and after flipping through it, I’m glad I did. I love it for the silliest reason, too – at the time of printing, the United States used three-digit phone numbers. There are plenty of things that I don’t really think about, and anything but seven-digit phone numbers are one of them (despite the fact that I know Brazil uses eight digits for cellular numbers, and don’t even get me started about their downright bizarre method of placing long distance calls). 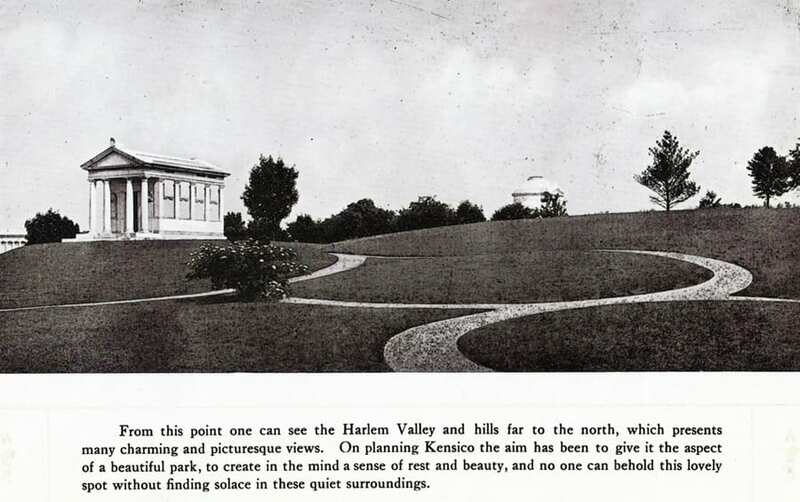 The book is chock-full of photos of the cemetery with plenty of open land, a much different view than today’s cemetery with over 130,000 “residents.” Below you’ll find a few of my favorite parts of the booklet, including the photo of Kensico Station. Wow, only a dollar to transport the remains! I do wonder how that worked though. I love the map. “Upper Tuckahoe.” No Fleetwood. 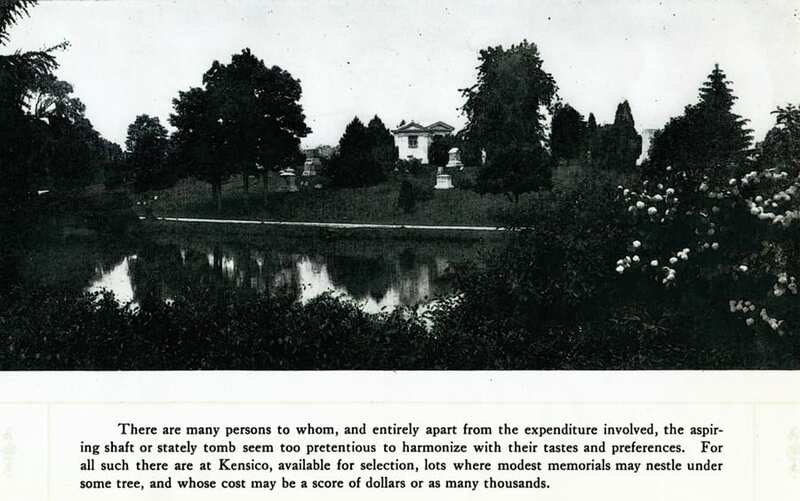 And because of the cutthroat competition in the cemetery business, no Woodlawn. Nice observation about Woodlawn. I totally didn’t catch that one. 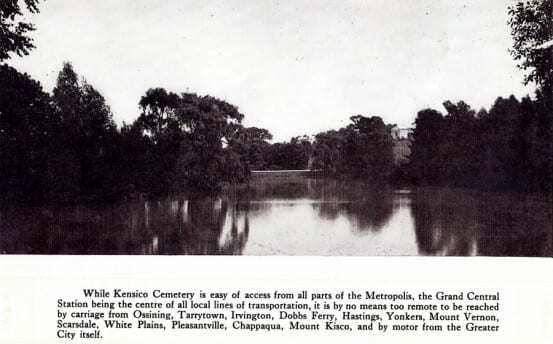 Data from findagrave.com. Looks like an entertaining place to be planted! enjoying your site, thank you. 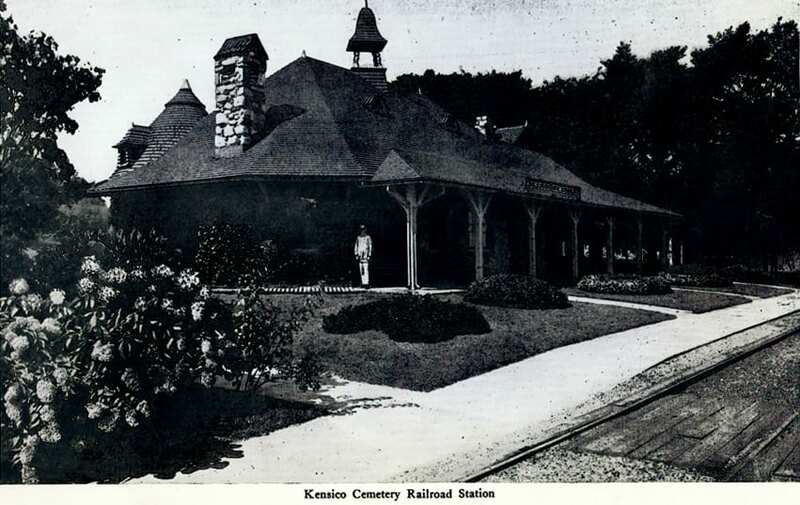 I am curious if anyone has ascertained the identity of the architect of the original kensico station. may be of assistance. thanks in advance for any info!